There was an M&S within a few minutes walk, we were able to purchase dinner from that shop and because there was a fridge in the room we purchased sandwiches and snacks for our flight as we did not purchase the meal on board. The location was awesome, just a few mins walk to Arrivals, couldn't ask for closer. The room and bathroom super clean and nice to have tea and milk in the room, as well as not being a tiny room and a great size tv!!! Would definitely stay there again! Clean, large room with up to date fixtures. Being at Gatwick Airport made it easier to get to our early flight home. Located at airport so easy to catch morning flights, but I expected better quality out of the Hilton brand. Perfect location for spending the night before an early departure or after a late arrival at the Gatwick Airport. Efficient check in, check out and service. It's not a luxury hotel, but it has a good standard: the rooms are spacious, clean and fully equipped. The staff at reception and the concierge and in the Garden restaurant. Super close to gatwick airport. Bed was pretty comfortable. Bathroom was clean. Location at airport and food in restaurant was good. Very convenient to the airport. The staff is very helpful and friendly. The bed was great! Some places look like they're getting a little tired (carpets), but we weren't there for a vacation, it was just overnight. We enjoyed the supper buffet (expensive but good) and the breakfast buffet (which we booked with our room). No time for breakfast - sorry. Conciege service excellent - really helpful. Check in also quick, competent and nice lady. Hilton London Gatwick Airport This rating is a reflection of how the property compares to the industry standard when it comes to price, facilities and services available. It's based on a self-evaluation by the property. Use this rating to help choose your stay! One of our top picks in Horley.Hilton London Gatwick Airport offers air-conditioned, soundproofed rooms and a 24-hour fitness center. Just 30 minutes from central London, The Hilton Gatwick is just minutes away from Gatwick Airport Station, offering direct trains to London Victoria and London Bridge. The North Terminal is only 10 minutes away, and it is easily accessible via the free monorail. Hilton London Gatwick Airport features 2 bars and a Costa Coffee shop. The Garden Restaurant serves breakfast and an evening buffet, while Amy’s Restaurant offers intimate modern dining. The elegant rooms each have a private bathroom, a work desk and high-speed internet access. Rooms also offer on-demand movies. The reception, concierge and room service are all 24-hour. 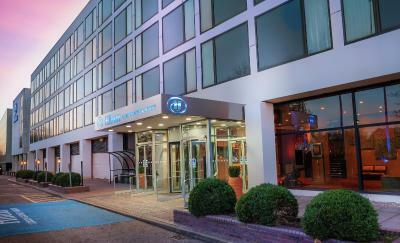 Hilton London Gatwick Airport is connected to Gatwick Airport South Terminal via a covered walkway, only a few minutes walking distance from check-in desks. North Terminal is around 10 minutes away via free 24/7 monorail service. When would you like to stay at Hilton London Gatwick Airport? Bright, airy rooms decorated in rich, warm tones and featuring a work desk, easy chair, a flat-screen TV with on-demand movies. Internet access is also available. This is a spacious room with an armchair, a foot-stool and a large walk-in shower. Contemporary style rooms, with a mosaic-tiled bathroom featuring a large walk-in shower. Also includes a large armchair with an ottoman stool, a work desk, and internet access also available. Modern room with a work desk, a large armchair and a luxurious mosaic-tiled bathroom. Internet access is also available. Bright, airy rooms decorated in rich, warm tones with a flat-screen TV and internet access. Recommended for 2 adults and 2 children up to the age of 12. This bright and airy room has high-speed internet access. Decorated in rich, warm tones, the room has 3 single beds and floor-to-ceiling windows. Maximum occupancy 3 adults. Please note that no extra beds or cots can be requested in this room. This air-conditioned room features a private bathroom, a flat-screen TV and a minibar. This suite features one double bed and guests can enjoy Executive Lounge access with complimentary continental breakfast and refreshments. Connected to the South Terminal via a covered walkway with less than 7 minutes walk, and only 30 minutes from the heart of London by Gatwick Express. Our fine dining Amy`s Restaurant offers an extraordinary experience where a sense of occasion is always on the menu. Fusing classic dining elements with the best of modern English cuisine in a sophisticated and contemporary setting, the emphasis is on flawless service. This sophisticated restaurant also offers a bar with carefully crafted cocktails and delicious afternoon tea. House Rules Hilton London Gatwick Airport takes special requests – add in the next step! Hilton London Gatwick Airport accepts these cards and reserves the right to temporarily hold an amount prior to arrival. 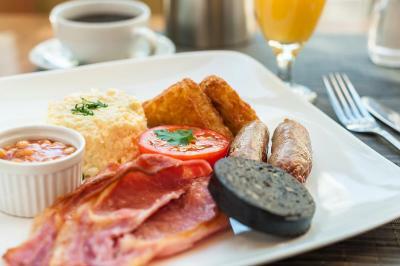 Breakfast is served from 05:30 until 10:30. Please note pets are not allowed where food is served. Staff to bar were rude and not observant on who to serve next , cocktails not made correctly had hardly any alcohol in (mojito) for the cost . Paid for a family room one of the beds was a small pull up bed that a child would struggle to get in . There were too few waiters in the restaurant. I had to wait long to get something to eat. The waiter had an attitude. friendly staff, great food, very comfy beds - location was excellent. will definitely book again. £38 for a buffet that was inedible and a vodka and 7-up in a tiny glass. Rooms need upgrading. Check in time was very long. The first time we stayed here the room was a bit shabby but the second time we stayed in the newer section and the room was really nice. Very convenient for the airport and good facilities including an iron, fridge, trouser press and a hairdryer. The bed was really comfortable! The rooms were very noisy and with no sound insulation - I kept waking up every time the people the next room turned on the tap! Convenient for the airport, easy to get to, booked on line , simple to do .